Uber Games Garden Checkers Game pieces set contains 24 garden checkers, black and white. We all know the great old game of checkers. This is that same game but in large proportions! Garden Checkers, or Garden Draughts (as it is called in Europe) is a fun game that can be played by all ages. Our Garden Checkers are made from durable PVC, and are waterproof and UV protected. Each Garden Checker piece measures just under 4 inches in diameter and 1.5 inches in height. Our garden checkers game is perfect for backyard play, corporate outings, team building events, hotels, shopping centers, schools, or set this game up at the beach or park and be sure to draw a crowd! Garden Checkers is perfect for outdoor parties, shopping centers, wedding receptions, or set this garden checkers game up at the beach or the park and draw a crowd! Not only does the Uber Games Garden Checkers Game Pieces Set look impressive, it also allows players of all ages to learn and enjoy Checkers in a unique way. 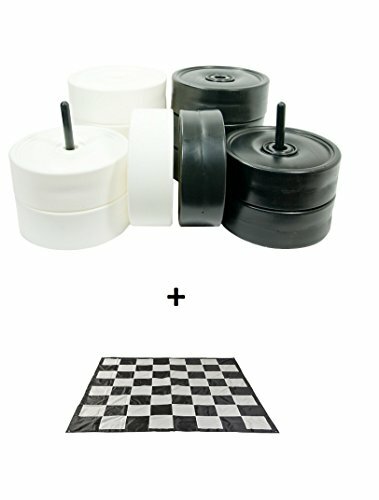 Also Available is the Garden Checkers Game Mat by Uber Games, made of sturdy nylon with metal grommets in each corner. It includes (4) metal stakes to secure your mat to the ground and (1) nylon Carrying Bag. Each square on the mat measures 6.75 inches by 6.75 inches. The total area used by the Garden Chess Mat measures 4.5 feet by 4.5 feet. This nylon mat can be easily unrolled and set up and then rolled back up for easy storage. Great for outdoor and indoor play. This is a lightweight alternative to the Garden Checkers Game Board.